We tried to squeeze the 50 Road March tunes into 1hr on Wednesday's show. 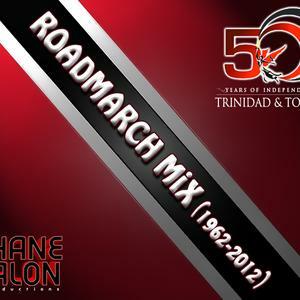 DJ Shane Talon does us one better as he skillfully delivers the tunes chronologically in over 2.5hrs. If you want ALL 50 songs, this is the mix for you! He starts the show with a bit of a retrospective of Carnival, Kaiso, Calypso, Soca and Trini culture. Kudos Shane, you do Trinis proud with this one! Check the entire extended mix below. 2010 JW & Blaze "Palance"
2009 Fay-Ann Lyons "Meet Super Blue"
2008 Fay-Ann Lyons "Get On"
2006 Machel Montano and Patrice Roberts "Band of De Year" B.O.D.Y. 2005 Shurwayne Winchester "Dead or Alive"
2004 Shurwayne Winchester "Look De Band Comin'"
2001 Shadow aka Mighty Shadow "Stranger"
2000 (TIE)Superblue / Iwer George "Pump Up" / "Carnival Come Back Again"
1995 Super Blue "Signal to Lara"
1994 Preacher "Jump and Wave"
1993 Super Blue "Bacchanal Time"
1992 Super Blue "Jab Jab"
1991 Super Blue (formerly Blue Boy) "Get Something and Wave"
1990 Tambu "We Ain't Going Home"
1988 Tambu "This Party Is It"
1986 David Rudder "Bahia Girl"
1984 Sparrow "Doh Back Back"
1980 Blue Boy "Soca Baptist"
1979 Poser "A Tell She (Smoke Ah Watty)"
1978 Calypso Rose "Soca Jam"
1975 Kitchener "Tribute to Winston Spree"
1972 Sparrow "Drunk and Disorderly"
1971 Kitchener "Madison Square Garden"
1969 Sparrow "Sa Sa Yea"
1964 Kitchener "This is Mas"